برای بررسی کنگلومراهای درون حوضه ای با قلوه های مسطح بخش زیرین سازند الیکا (تریاس زیرین) چهار برش چینه ای در کوه های البرز در شمال ایران انتخاب شد. ستبرای بخش زیرین سازند الیکا در این برش ها از 95 متر در برش الگو تا 195 متر در برش ورسک است. این بخش به طور عمده در برگیرنده تناوبی از سنگ آهک نازک تا ضخیم لایه با آشفتگی زیستی فراوان و شیل است که درشرایط آرام و طوفانی نهشته شده اند. کنگلومراهای درون حوضه ای با قلوه های مسطح از مهم ترین رخساره های طوفانی هستند. این کنگلومراها با مرز ناگهانی یا فرسایشی در میان رخساره های وابسته به شرایط آرام جای دارند. این رخساره ها از چند سانتی متر تا 100 سانتی متر ستبرا دارند و به طور عمده از اینتراکلست های در اندازه گراول ساخته شده اند. اینتراکلست ها در لایه های نازک به طور افقی تا نیمه افقی هستند ولی در لایه های ضخیم تر به طور زاویه دار و گاه در جهات مخالف هم قرار دارند. بافت آن ها به طور عمده ردستون و گاه فلوتستون است. بررسی های صحرایی و میکروسکوپی نشان می دهند که این کنگلومراها به وسیله جریان های ایجاد شده از منشاء طوفان های قوی در زیر-محیط های دریای باز، پشته های زیردریایی، تالاب و پهنه کشندی/برجستگی ساحلی وابسته به پلاتفرم های رمپ همشیب کربناته نهشته شده اند. To study intraformational flat pebble conglomerates of the lower member of the Elika Formation (Lower Triassic), four stratigraphic sections in the Alborz Mountains of northern Iran were selected. The thickness of the lower member of the Elika Formation in these sections ranges from 95 meters in the type section to 195 meters in the Veresk section. This member mainly consists of heavily bioturbated thin to thick-bedded limestone and shale intercalations which deposited under fair-weather and storm conditions. The intraformational flat pebble conglomerates are the most important of the storm facies. These conglomerates have sharp or erosional bases and interbedded with the fair-weather facies. These facies rang from a few centimeters to 100 cm thicknesses, and mainly consist of gravel- size intraclasts. The intraclasts are horizontal to sub- horizontal in the thinner beds, but they are imbricated, sometimes opposing orientations in the thicker beds. Their textures are mainly rudstone and sometimes floatstone. Field and microscopic studies indicate that the intraformational flat pebble conglomerates were deposited by powerful storm generated flows in open marine, shoal, lagoon and tidal flat/ beach ridge sub-environments related to carbonate homoclinal ramp platforms. جهانی، د. و کیانی راد، م. ر.، 1386- رخساره‌ها و محیط رسوبی بخش زیرین سازند الیکا (تریاس زیرین) در ناحیه شمال غرب آبگرم قزوین، فصلنامه علمی- پژوهشی زمین، دانشگاه آزاد اسلامی واحد تهران شمال، سال دوم، شماره 3، پاییز، صص. 1 تا 15. 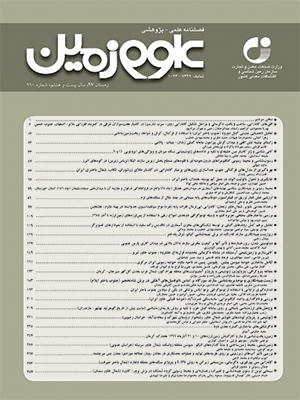 طهماسبی، ع. ر.، 1376- بررسی میکروفاسیس، محیط‌های رسوبی چینه شناسی توالی‌های بخش زیرین و میانی سازند الیکا در شرق البرز مرکزی، پایان نامه کارشناسی ارشد، دانشگاه تربیت معلم، 123 ص. لاسمی، ی. و جهانی، د.، 1380- نهشته‌های طوفانی بخش زیرین سازند الیکا (تریاس زیرین)، مجله علمی و پژوهشی علوم پایه، دانشگاه آزاد اسلامی، واحد علوم و تحقیقات، سال یازدهم، شماره 40، صص. 3005 تا 3024. لطف‏پور، م.، 1376- بررسی میکروفاسیس، محیط‌های رسوبی چینه شناسی توالی‌های بخش میانی و بالایی سازند الیکا در شرق البرز مرکزی، پایان نامه کارشناسی ارشد، دانشگاه تربیت معلم، 148 ص.
Aigner, T., 1982- Calcareous Tempestites: Storm Dominated Stratification in Upper Muschelkalk Limestones (Middle Triassic, ZW Germany). In Cyclic and Event Stratification (eds G. Einsele and A. Seilacher), New York, Springer-Verlag, p.180-198. Aigner, T., 1985- Storm Depositional Systems. Lecture Notes in Earth Sciences, Springer Verlag, Berlin, 174 p.
Alavi, M., Vaziri, H., Seyed-Emami, K. and Lasemi, Y., 1997- The Triassic and associated rocks of the Nakhlak and Aghdarbad area in central and northeastern Iran as remnants of the southern Turanian active continental margin: Geological Society ofAmerica Bulletin, V. 109, p. 1563-1575. Bathurst, R. G. C., 1975- Carbonate sediments and their diagenesis. Elsevier, Amsterdam, 658 p.
Brönnimann, P., Zaninetti, L., Bozorgnia, F. and Huber, H., 1972- Ammodiscids and Ptycholadis from the Triass Elika Formation, Nessa-Hasankdar section, Central Alborz, Iran, Riv. Ital. V. 78, p. 1-28. Dionne, J. C., 1971- Vertical packing of flatstones. Can. J. Earth Sci., V. 8, p. 1585-1591. Dunham, R.J., 1962- Classification of carbonate rocks according to depositional texture. In Ham, W.E., ed., Classification of Carbonate Rocks. American Association of Petroleum Geologists Memoir, V. 1, p. 108-121. Embry, A. F. and Klovan, J. E., 1971-A Late Devonian reef tract on Northeastern Banks Island, NWT: Canadian Petroleum Geology Bulletin, V. 19, p. 730-781. Flügel, E., 2010- Microfacies of carbonate rocks, analysis, interpretation and application. Springer, Berlin, 984 p.
Glaus, M., 1964- Trias und oberperm in Zentralen Elburs (Persien): Eclogae. Geol. Helv., V. 57, p. 497-508. Haq, B. U., Hardenbol, J. and Vail, P. R., 1987- Chronology of fluctuating sea levels since the Triassic: Science, V. 235, p. 1156-1167. Hirsch, F. and Sussli, P., 1973- Lower Triassic Conodonts from the lower Elikah Formation, Central Alborz Mountains (North Iran). Eclogae Ceol. Helv.,V. 66, p. 525-531. Komatsu, T., Naruse, H., Shigeta, Y., Takashima, R., Maekawa, T., Dang, H. T., Dinh, T. C., Nguyen, P. D., Nguyen, H. H., Tanaka, G. and Sone, M., 2014- Lower Triassic mixed carbonate and siliciclastic setting with Smithian-Spathian anoxic to dysoxic facies, An Chau basin, northeastern Vietnam.Sedimentary Geology, V. 300, p. 28-48. Kullberg, J. C., Oloriz, F., Marques, B., Caetano, P. S. and Rocha, R. B., 2001- Flat-pebble conglomerates; a local marker for Early Jurassic seismicity related to syn-rift tectonics in the Sesimbra area Lusitanian Basin, Portugal. Sedimentary Geology, V. 139(1), p. 49-70. Kwon, Y. K., Chough, S. K., Choi, D. K. and Lee, D. J., 2002- Origin of limestone conglomerates in the Choson Su­pergroup (Cambro-Ordovician), mid-east Korea. Sed­imentary Geology, V. 146, p. 265-283. Lasemi, Y., Ghomashi, M., Amin-Rasouli, H. and Kheradmand, A., 2008- The Lower Triassic Sorkh Shale Formation of the Tabas Block, East Central Iran: succession of a failed-rift basin at the Paleo-Tethys margin. Carbonates and Evaporites, V. 23, p. 21-38. Lasemi, Y., Jahani, D., Amin – Rasouli, H. and Lasemi, Z., 2012- Ancient Carbonate Tidalites. In: R. A. Davis, Jr. and R. W. Dalrymple (eds. ), Principles of Tidal Sedimentology, Springer Science, p. 567-607. Mount, J. F. and Kidder, D., 1993- Combined flow origin of edgewise intraclast conglomerates: Sellick Hill Formation (Lower Cambrian), South Australia. Sedimentology, V. 40, p. 315-29. Myrow, P. M., Tice, L., Archuleta, B., Clark, B., Taylor, J. F. and Ripperdan, R. L., 2004- Flat-pebble conglomerate: its multiple origins and relationship to metre-scale depositional cycles. Sedimentology, V. 51, p. 973-996. Nakazawa, K., Bando, Y. and Golshani, F., 1981- Lower Triassic bivalves from the Elikah valley, Central Alborz Ragen, Iran. Ceol. Surv. Iran., Tehran, Rep., V. 49, p. 133 -153. Osleger, D. and Read, J. F., 1991- Relation of eustasy to stacking patterns of meter-scale carbonate cycles, Late Cambrian, USA. J. Sed. Petrol., V. 61, p. 1225-1252. Pratt, B. R., 2002- Tepees in peritidal carbonates: origin via earthquake- induced deformation, with example from the Middle Cambrian of western Canada. Sed. Geol., V. 153, p. 57-64. Pruss, S. B., Corsetti, F. A. and Bottjer, D. J., 2005- The unusual sedimentary rock record of the Early Triassic: A case study from the southwestern United States. Palaeogeography, Palaeoclimatology, Palaeoecology, V. 222, p. 33-52. Purser, B. H., 1973- The Persian Gulf- Holocene carbonate sedimentation and diagenesis in a shallow epicontinental sea. Springer, New York, 471p. Rankey, E. C. and Berkeley, A., 2012- Holocene carbonate tidal flats. In: In: R. A. Davis, Jr. and R. W. Dalrymple (eds. ), Principles of Tidal Sedimentology, Springer-Science, p. 507-535. Schubert, J. K. and Bottjer, D. J., 1995- Aftermath of the Permian-Triassic mass extinction event: paleoecology of Lower Triassic carbonates in the western USA. Palaeogeogr Palaeoclimatol Palaeoecol, V. 116, p. 1-39. Sepkoski, J. J. Jr., 1982- Flat-pebble conglomerates, storm deposits, and the Cambrian bottom fauna. In: Cyclic Event and Stratification (Eds G. Einsele and A. Seilacher), Springer-Verlag, Berlin, p. 371-388. Sepkoski, J. J., Bambach, R. K. and Droser, M. L., 1991- Secular changes in Phanerozoic event bedding and the biological imprint. In: Einsele, G., Ricken, W., Seilacher, A. (Eds. ), Cycles and Events in Stratigraphy. Springer–Verlag, Berlin, p. 298-312. Seyed-Emami, K., 2003- Triassic in Iran: Facies, V. 48, p. 91-106. Shinn, E. A., 1969- Submarine lithification of Holocene carbonate sediments in the Persian Gulf. Sedimentology, V. 12, p. 109-44. Shinn, E. A., 1983- Birdseyes, fenestrae, shrinkage pores and loferites: a re-evaluation. J. Sed. Petrol, V. 53, p. 619-628. Stampfli, G., Zaninetti, L., Bronnimann, P. and Jenny, C., 1976- Trias de I' Elbourz oriental, Iran. Stratigraphie, Sedimentologie, Micropaleontologie. Riv. Ital. Paleontl., Milano, V. 82(3), p. 467 -500. Trussell, G. C., 1997- Phenotypic selection in an intertidal snail: effects of a catastrophic storm, Marine Ecology Progress Series, V. 151, p. 73-79. Tucker, M. E. and Wright, V. P., 1990- Carbonate Sedimentology. Blackwell, Oxford, 482 p.
Tucker, M. E., 1982- Storm-surge sandstone and deposition of interbeded limestone: Late Precambrian, southern Norway. In: Cyclic and Event Stratification (Ed. by G. Ensele and A. Seilacher), Spriger-Verlag, Berlin. p. 363-370. Twitchett, R. J. and Wignall, P. B., 1996- Trace fossils and the aftermath of the Permo-Triassic mass extinction : evidence from northern Italy, Palaeogeog. Palaeoclim, Palaeoecol, V. 124, p. 137-151. Van Loon, A. J., Han, Z. and Han, Y., 2013- Origin of the vertically orientated clasts in brecciated shallow-marine limestones of the Chaomidian Formation (Furongian, Shandong Province, China). Sedimentology, V. 60, p. 1059-1070. Vierek, A., 2013- The palaeogeographical background of Late Devonian storm events in the western part of the Holy Cross Mountains (Poland). Geologos, V. 19, p. 257-272. Wignall, P. B. and Twitchett, R. J., 1996- Oceanic anoxia and the end-Permian mass extinction. Science, V. 272, p. 1155-1158. Wignall, P. B. and Twitchett, R. J., 1999- Unusual intraclastic limestones in Lower Triassic carbonates and their bearing on the aftermath of the end-Permian mass extinction. Sedimentology, V. 46, p. 303-316. Wilson, J. L., 1975- Carbonate Facies in Geologic History. Springer-Verlag, Berlin, 471 p.
Wilson, M. D., 1985- Origin of Upper Cambrian flat pebble conglomerates in the Northern Powder River Basin, Wyoming. 7th SEPM Core Workshop. Golden, CO, p. 1–50. Zaninetti, L., Bronniman, P., Bozorgnia, F. and Huber, H., 1972- Étude lithologique et micro-paléontologique de la formation d‘Elika dans la coupe d’ Aruth, Alborz Central, Iran septentrional., Arch. Sci. Généve, V. 25(2), p. 215-249.